AWS Marketplace is a digital catalog of software solutions from independent software vendors (ISVs) that offer a variety of pricing options, including SaaS contracts, hourly billing, annual licenses, and private offers for their software products. Almost half of these AMI products offer annual subscription options, so customers often ask me how to know when it’s best to purchase an annual license. In certain cases, using annual licenses to procure AMI products in AWS Marketplace can be a significant cost-saving mechanism for your business. However, it is important to understand the annual pricing model and the various factors that need to be considered before you make the jump. In this post, I will offer an approach for determining when it’s best to buy annual licenses for products in AWS Marketplace. How do annual licenses work for software products in AWS Marketplace? Certain software products in AWS Marketplace offer an annual subscription pricing model. An annual license enables you to make a one-time, upfront payment for the following year on a per-instance basis. For each annual license you purchase, you don’t pay any hourly usage fees for the next year for a single Amazon Elastic Compute Cloud (Amazon EC2) instance with the associated instance type. However, note that an annual license applies only to that single instance; any additional instances launched for that AWS Marketplace software product will be billed hourly. Please note that the annual license costs discussed are related to AWS Marketplace software only. The AWS infrastructure costs associated with the products you launch are billed separately. You can utilize Amazon Reserved Instances for further cost savings; I describe how to do that in the Additional cost savings section towards the end of this post. 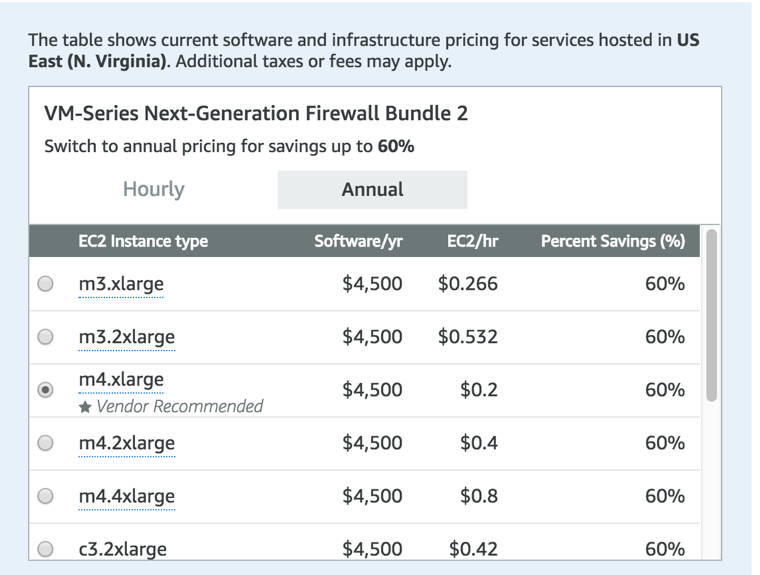 Annual license pricing is tied to an EC2 instance type and billed upfront. The annual license(s) can be used by any account in the consolidated billing family, provided they have Identity and Access Management (IAM) permissions to use the products in AWS Marketplace, for the given duration of the subscription. AWS Marketplace will try to apply the annual pricing to the account owning the annual license first. If the owner account does not have a running EC2 instance with the product from AWS Marketplace, annual pricing is applied to a running EC2 instance in one of the other accounts in your AWS Organization. Additionally, a discounted price is applied to as many concurrent instances with the associated instance type as the number of annual licenses purchased, launched across availability zones and regions. This will help you maximize your annual license usage in your consolidated billing family if you have a multi-region setup. Note: If your AWS Organizations has multiple organizational units (OUs), it’s important to consider that you cannot restrict annual license benefits to a particular OU in your organization. In the diagram below, I have provided an AWS Organizations view to describe how an annual license purchased from AWS Marketplace would be applied within a consolidated billing family. How is annual license pricing applied in this scenario? Let’s assume that there is one product from AWS Marketplace with five annual licenses for ‘t2.micro’ sized EC2 instances purchased in the Linked Account 1 of the AWS Organizations shown in the diagram above. 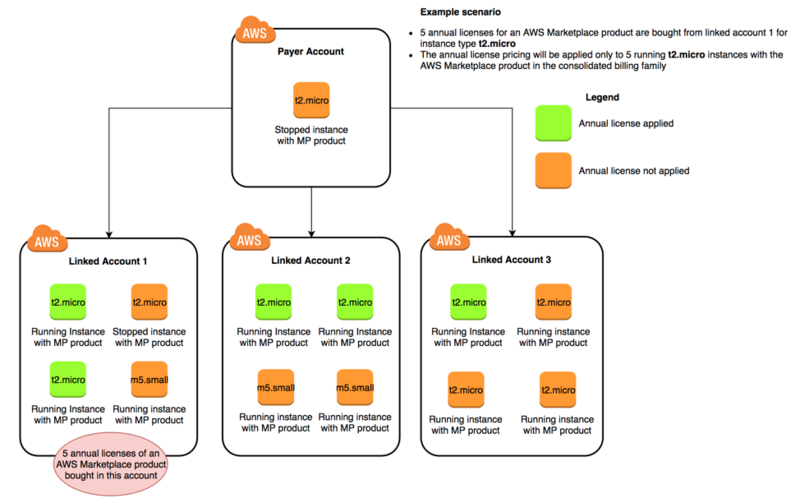 Also, all the EC2 instances launched in this scenario will be running on the purchased AWS Marketplace product AMI. In the payer account, annual license is not applied to the EC2 instance of the size ‘t2.micro’, since it is in the stopped state. In the Linked Account 1 above, annual license is applied to the two running EC2 instances of the size ‘t2.micro’. The annual license is not applied to a running EC2 instance of the size ‘m5.small’ because it is not the correct instance type, or to the ‘t2.micro’ instance because it is stopped. In the Linked Account 2 above, annual license is applied to the two running EC2 instances of the size ‘t2.micro’. The annual license is not applied to the two running EC2 instances of the size ‘m5.small’ because they are not the correct instance type. At this point, four instances are utilizing the annual pricing licenses for the selected AWS Marketplace product, leaving us with one remaining license. The Linked Account 3 above receives annual license pricing for only one of the running EC2 instances of the size ‘t2.micro’. No other running EC2 instances of the size ‘t2.micro’ in this account will receive annual license pricing, since the five annual licenses are exhausted in the consolidated billing family. If one of the t2.micro instances is stopped, any one of the other t2.micro instances in the other accounts may pick up the annual license. This is not deterministic and depends on which instance next sends a metering record to the AWS Commerce Platform. Before you commit to an annual license for any product in AWS Marketplace , consider trying out a product of your interest with a small instance type (e.g. t2.micro), with hourly billing to forecast your production capacity requirements to avoid incurring significant charges. This will help you right-size your instance size while buying an annual license, since you cannot change it after purchase to another instance size. You can also take advantage of free trials offered by several products. Your findings in the experimentation phase will allow you to reduce final operating cost by right-sizing your annual license purchases. Buy annual licenses for products that you think you will be running continuously through the year so that you reap the cost benefit of annual licensing. For instance, if you buy an annual license that is 25 percent cheaper than the hourly price for a year, then it makes sense to buy the annual license if you have confidence that the product will run for more than nine months in a year, i.e., for more than 75 percent of the year. This will help you focus on products in which you have a high degree of confidence from an operational perspective and gain savings from the annual licenses that you purchase. Once you shortlist the most suitable products and instance types in the experimentation phase, meet with your business stakeholders to review the financial commitment and a break-even analysis for the selected products. Additionally, you should obtain a commitment from the technical stakeholders on the use of the proposed instance types for the annual licenses to be obtained. 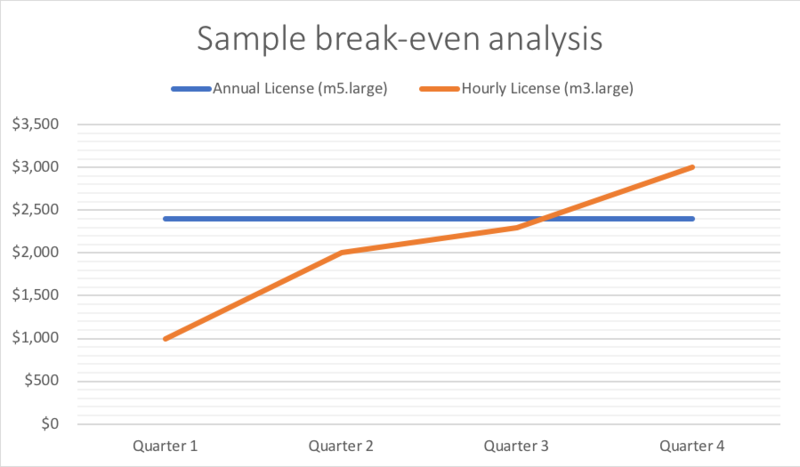 I have provided a sample break-even analysis below, where an annual license for an m5.large instance costs $2,400 annually, while an hourly license for the same instance would cost $3,000 for 12 months of continuous use. The break-even point for this annual license with an m5.large instance type is 9.6 months of continuous use. After purchasing annual licenses from AWS Marketplace, monitor metrics around your annual license utilization as well as unused annual licenses. This will provide you a clear picture on your AWS Marketplace spend and help you maximize annual license usage across your consolidated billing family. Before the end of every annual license term, assess your yearly metrics and decide if that annual license provides the intended cost benefits. Your renewal decision should be based on your findings from this exercise. Since every annual license has a different start/end date, have a process around actively monitoring these dates. Your metrics around hourly AWS Marketplace products will help you determine if there are any candidates that can boost your cost savings. Once you perform that analysis, I recommend repeating steps 1-4 for all your new annual licensing product candidates. Once you have purchased your annual license for a product in AWS Marketplace, you can combine your annual license commitment with infrastructure pricing discounts by using Amazon Reserved Instances. The combination of annual pricing for AWS Marketplace and discounted pricing for Amazon Reserved Instances will provide you with the highest overall cost savings for your total yearly commitment. If you are considering the purchase of large volumes of annual licenses, you can check if the product ISV provides an option of private offer pricing. This will allow you to negotiate custom price and End User License Agreement (EULA) terms for your software purchases. In this post, I have explained a methodology for the selection of annual licenses using a four-step approach. You can follow these steps to define your AWS Marketplace procurement strategy, and utilize the cost benefits offered by the annual licensing model. For more information on the benefits of annual licenses, how to buy an annual license, and Frequently-Asked Questions (FAQs) about annual licenses, please visit the AWS Marketplace Help and FAQ. If you have questions about the approach provided in this blog post, you can start a new thread on the AWS Discussion Forum or contact AWS Support. Sagar Khasnis is a Partner Solutions Architect focusing on AWS Marketplace and AWS Service Catalog. He is passionate about building innovative solutions using AWS services to help customers achieve their business objectives.